Can you tell us how Morningstar got its start into gaming? How large is your current gaming community? Morningstar Community got started with about eight people that played together back in the beginning of Runes of Magic. Today we have somewhere over 1,000 members across different games such as, ROM, League of Legends, to Firefall, GW2, WoW, and of course SWTOR. How did Morningstar get started in SWTOR? What server and faction is the guild a part of? Being a multi-gaming community, most new releases have at least the interest of a few people of our community, so if even a few plan on getting into a game, plans are made for starting a guild there. Since SWTOR was such a highly anticipated game, and gave us the option to form guilds via the website pre-launch, Morningstar launched on day one on the Grandmaster Zym server. At that time for the Morningstar community, there would be regularly more people in our guild, than everyone on the fleet. Morningstar was well known, because we made up the large majority of the server population. At the time, few other guilds had the numbers to even attempt end game. Post-merger, we are now on the Shadowlands server and part of the Galactic Republic faction. We do have an Imperial guild called Eveningstar, but it really only consists of our alts. Is it correct, after the server mergers, Morningstar began opening its doors to those players whose guild fell by the wayside or any displaced players? How does this work and do you feel an outreach like this helps to strengthen server communities? It is, after the server merges that we all know were poorly executed, our guild’s leadership saw an opportunity to give a home to dozens of people who had to start looking for a guild all over again. Ultimately, a community thrives on new people, and making them feel welcome and part of our community is how we chose to help. This also is what keeps the Morningstar community strong, growing and loyal. Morningstar, even though considered a casual guild, prides itself on being a very strong endgame raiding/operations based guild, correct? How many current Ops teams does the guild have raiding regularly? Yes, we are a casual guild, and we say that because that is the atmosphere of the guild. We are serious about raiding, and the times set aside to raid. However, we have fun doing it and no one is called out for messing up, no one is replaced mid raid, everyone is treated as equals. We raid every night be it a scheduled raid or an open raid for whoever wants in. These open invite raids are used for teaching fights or gearing new raid toons. We have two raid teams Red team and Blue team. Currently while most people are leveling post 2.0, we don’t have set schedules for either team; we just set up a raid for whoever is on and level 55 and what lockouts aren’t used. As more people begin to hit level 55, we will be splitting back up into two teams with schedules becoming necessary. Even with several members leveling, we still are the second Republic guild to record a Toborros Courtyard kill, and the sixth to record an S&V clear…All the while Morningstar remains casual about things. What has been the most challenging Operation, thus far? Has the guild gone through the new Operation, Scum and Villainy? How does the new Op stack up with the previous ones? So far, I think EC HM was by far the hardest op given the gear readily available at the time. On the other hand, we cleared TFB on day one and S&V we cleared on our second attempt at it. All that said we enjoy S&V the most. It is visually more appealing, the boss fights have more variation in appearance and mechanics; and yet they all somewhat fit into the overall story. Although Morningstar has very high-level endgame raiding, the guild believes in helping every member be a part of endgame Ops, is this right? Why does the guild do this and how has it improved Morningstar as a guild? Absolutely, as the new guild leader, I still hold onto my previous raid leader role. If anyone wants to raid they can, if it means that I have to organize five raid teams across everyone’s schedule I will do that. We each have multiple alts, so even if the guild clears the new ops Scum and Villainy, if someone wants to go, we are ready to form a new raid and hit it again. That being said, we try to keep the best eight people in our progression team, but overall schedules dictate who is in what team. We are a large guild, and in large guilds people are often left out of raiding, be it the two teams are already full or the raid leader is unwilling to manage a third team. That doesn’t happen in Moringstar, as long as people who aren’t in a raid team want to raid consistently, we will continue to create raid teams. Our open raid format, on off nights, helps meet the needs for those who cannot commit to a raid schedule. Is the guild looking to improve its player base in PVP and is it actively recruiting for this area? We are, we all PVP a little bit, but we have nothing organized. We are looking for someone to be a PVP officer to organize events, or some PVP nights, but still remain true to our casual approach. We have a lot of people that solo PVP or would PVP if someone that was really into it and could help guide them. I think there is an opportunity there for us as a guild, and for someone who wants to step up to be an officer. 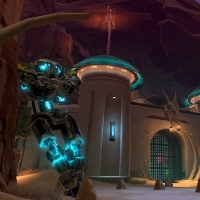 What are the current plans for a SWTOR ranked PVP team in the guild? Does BioWare’s current system live up to goals the guild has for the future of ranked PVP? We currently have neither ranked teams, nor any plans in the future for them. Most likely we will not have them until we can find someone willing to organize PVP for us. Morningstar is more than a guild it is an entire gaming community. How much work is it to organize the various games and members associated within Morningstar? Who are the ones that help make the entire community run as smoothly as possible in Morningstar? A lot of time and money goes into keeping the community organized. Our community leader known as Lum, has a vision and a drive that I have never seen before. He created Morningstar community with the idea that going from game to game doesn’t mean searching for new friends where finding a good guild ultimately defines how good the game is. The atmosphere in Morningstar develops an intense feeling of loyalty to it, that being said everything done to develop the community is done on the free time of our members. Our community has a very nice mumble server with a 1,000 user capacity we have an innovative website thought up and created by Lum and some of our members that I cannot tell you about as it has not officially launched. There are plans for T-shirts with logos, hats, and other merchandise, with profits going to the Community. We also have a rather large YouTube channel most known for our two minute reviews of every game imaginable, with profits from advertising going into the mumble server and website. Not to mention that Lum pays a lot out of pocket to keep us going, we also have member financial support, should they want to contribute. As for the SWTOR branch of Morningstar, are you currently recruiting? What are the requirements, if any, that potential recruits need to meet when submitting an application? We are recruiting but we don’t require an application process, if anyone wants to join they get an invite on the spot. We have not yet had any issues with this as most people are looking for that Casual atmosphere and we are so easy to fit in with. I have not yet had to remove anyone from guild for any purpose, so at the moment our invitation to the guild remains open. How is the best way for those players seeking to join the ranks of Morningstar to contact and find out more information concerning the guild? By contacting Jayda-Brooke in game, be it a whisper or mail. They can reply to our guild recruitment thread on the SWTOR forum. Or do a /who Morningstar and ask for any officers if they want to chat first. We have had a few people request to run with us first which we are also happy to do. What is the best thing that has happened to you since joining the Morningstar guild and gaming community? Why would you recommend this guild to other SWTOR players on the Shadowlands server? Morningstar is a casual guild with quality people that can get stuff done. We are a large guild with that small guild atmosphere of everyone knows everyone. To me that is the dream guild everyone strives for, it’s hard to build and even harder to maintain, but we are doing it. I believe in this guild, and I believe it is the best guild on the server, maybe the game. I would recommend this guild to anyone; they only need to experience it to know that the above statement is true. That’s it for this week’s Community Checkpoint. Thanks to all the members that make up the Morningstar gaming community. I want to thank Mange, their guildmaster, for all his help. It is great to see players enjoy raiding at a high level, while remaining casual enough to keep every member involved and grow their gaming community! If you are on the Shadowlands server with a Republic character, and looking to be a part of some serious raiding but in a casual atmosphere why not contact the Morningstar guild. If you would like to possibly have your guild, like Morningstar, highlighted on Community Checkpoint…all you need to do is submit your guild/group’s website and some basic information in an email to me at, jason@corellianrun.com. We love to highlight members in the SWTOR community, from guilds to the many people working to plan events, contest, etc. We look forward to hearing from you! Thanks and see you next week!